Dr. Welsh received an MD and completed an internal medicine residency at the University of Iowa. He trained in pulmonary medicine and research at the University of California, San Francisco and the University of Texas, Houston. He then joined the University of Iowa as an Assistant Professor, where his clinical activies focused on pulmonary diseases. He is currently the Roy J. Carver Professor of Internal Medicine and Molecular Physiology and Biophysics. He directs the Pappajohn Biomedical Institute and the Cystic Fibrosis Research Center. He is an Investigator of the Howard Hughes Medical Institute. Dr. Welsh served as President of the American Society for Clinical Investigation and as President of the Association of American Physicians. He has been elected to the National Academy of Medicine, the American Academy of Arts and Sciences, and the National Academy of Sciences. 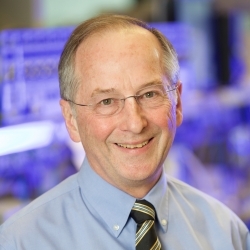 He has received many awards including the Carver College of Medicine Distinguished Mentor Award, the Cystic Fibrosis Foundation Paul di Sant'Agnese Distinguished Scientific Achievement Award, the American Thoracic Society J. Burns Amberson Award, the Doris F. Tulcin Cystic Fibrosis Research Award, the American Physiological Society Walter B. Cannon Award, and the Indiana University Steven C. Beering Award. I am deeply honored to be recognized with Lap-Chee Tsui, Francis Collins, Bonnie Ramsey, and Paul Negulescu. In accepting this award, I acknowledge so many other people who contributed: talented students and trainees, my tireless and innovative assistants, my cherished colleagues and my collaborator, Alan Smith and his team at Genzyme. I thank the University of Iowa, the Howard Hughes Medical Institute, the National Institutes of Health, and the Cystic Fibrosis Foundation for their support. Most of all, I thank my family, whose love and support made everything possible.